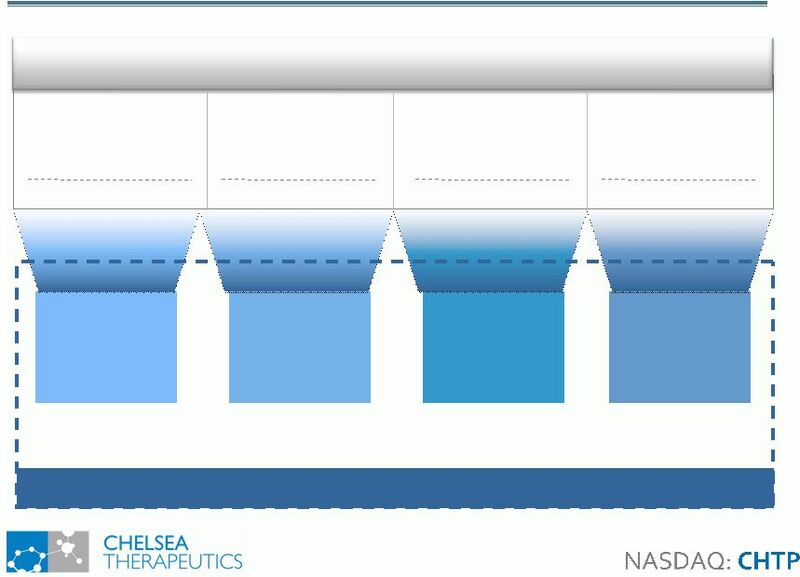 (GLOBE NEWSWIRE) - Chelsea Therapeutics International, Ltd. (Nasdaq:CHTP) announced the completion and favorable outcome of an independent Data Monitoring Committee (DMC) review of the safety and efficacy data from approximately half the target enrollment in Chelsea's Phase II trial of droxidopa in fibromyalgia. The purpose of this scheduled DMC meeting was to review the efficacy of each dose group and determine if the efficacy data supported dropping underperforming arms in order to increase the power in those arms most likely to demonstrate a clinically relevant therapeutic benefit. Following their assessment of each of the 12 arms using the study's primary endpoint, a reduction in pain as measured by the Short Form McGill Pain Questionnaire, the DMC recommended that 7 of the 12 arms of the trial be continued to completion. This recommendation was based solely on their efficacy analysis, as there were no observed safety concerns associated with any arm of the study. As a result of this recommendation, the study will now focus primarily on multiple doses of droxidopa in combination with 50mg carbidopa. "The DMC's recommendation aligns with our assumption going into the trial that by pairing droxidopa with carbidopa to limit peripheral metabolism of droxidopa, we should be able to drive efficacy of droxidopa in the treatment of fibromyalgia," commented Dr. Simon Pedder, president and CEO of Chelsea Therapeutics. "Following the interim analysis conducted by the DMC and subsequent recommendations, we can now, as hoped, allocate our full study resources to those treatment groups most likely to demonstrate therapeutic benefit and their associated control and placebo arms." The Phase II trial, is a multi-centre, randomized, double-blind, placebo-controlled, dose response, factorial study that initially included 12 parallel groups evaluating droxidopa monotherapy, carbidopa monotherapy, droxidopa/carbidopa combination therapy or placebo. Accordingly, patients were randomized into each of 12 groups to receive: 200mg, 400mg or 600 mg of droxidopa TID; 25mg or 50mg carbidopa TID; 200/25mg, 400/25mg or 600/25mg droxidopa/carbidopa TID; 200/50mg, 400/50mg or 600/50mg droxidopa/carbidopa TID; or placebo over a 9-week treatment period. Based on the DMC recommendation, the trial will be optimized to continue enrollment in the following seven arms: placebo; 50mg carbidopa TID, 600mg droxidopa TID; 400/25mg, 200/50mg, 400/50mg or 600/50mg droxidopa/carbidopa TID. The primary endpoint is the average reduction in pain as measured by the Short Form McGill Pain Questionnaire. Secondary outcomes of the study include Fibromyalgia Index Questionnaire (FIQ), Patient Global Impression of Change (PGI-C), Multidimensional Fatigue Inventory (MFI), and Hamilton Anxiety Depression survey (HAM-A). Chelsea currently estimates top-line data from the study to be reported by year-end 2011. Fibromyalgia is a chronic and debilitating condition that is characterized by widespread pain and stiffness throughout the body, accompanied by severe fatigue, insomnia and mood symptoms. While the precise etiology of fibromyalgia remains unknown, current research has focused on the role of norepinephrine (NE) reuptake and availability in the central nervous system. NE, a widely used neurotransmitter in the central and peripheral nervous systems has long been linked to both chronic pain and depression. Droxidopa, a synthetic amino acid, is converted by the body into norepinephrine and, as a prodrug of NE, provides replacement therapy for NE deficiency. While NE, as a catecholamine does not penetrate the blood-brain barrier, droxidopa, as a neutral amino acid, is able to do so thus providing both a peripheral and central affect on circulating NE levels.